I've been meaning to write a post here about how much I am totally in LOVE with Project Life (or photo pocket style scrapbooking). It gives me the chance to quickly document the special and fun things happening in our lives easily. I can be a little creative with it, or I can just put it together simply and get it documented. If you've never heard of Project Life, you should definitely check it out! Sometimes I like to design my own cards that fit the pockets and print them at home. This allows me to create specific cards or some that match a special photo. Plus, it's fun! 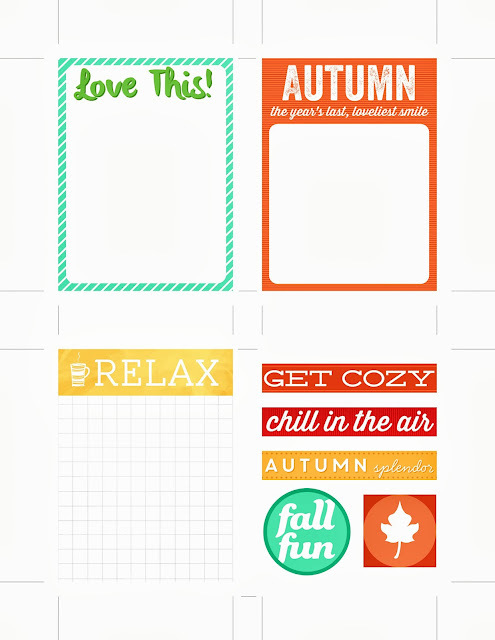 Anyway, in honor of my love of Project Life, I am sharing some printable Project Life cards and shapes with an Autumn theme. If you already do Project Life, I hope you find them useful, and if you don't, you really should look into it! Thank you for these. I bought my first project life kit when it debuted on HSN and it is still sitting in the box waiting for me. Someday I will have so much time on my hands then all I can do is scrapbook!